When a home plate umpire is injured and leaves the game, who replaces him? 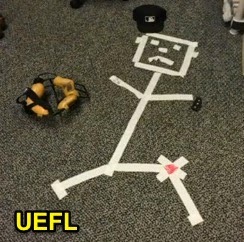 And what happens to the injured umpire after he gets removed from the contest? When an umpire leaves, the questions begin. This question found its way to the UEFL mailbox after Jerry Layne's game-ending head injury Wednesday in Baltimore, when 2B Umpire Alan Porter replaced Layne behind the plate for the remainder of that day's game. Answer: Subject to Crew Chief discretion, the second base umpire shall replace an injured plate umpire (MLB Umpire Manual VI). If the injury occurs before the game is official, this umpire's next game assignment will be at third base. If the injury occurs after the game is official, this umpire's next assignment will be at first base. The injury's extent dictates response protocol. As for the injured umpire, the extent of the injury shall govern the return-to-play procedure. For instance, if a "simple" illness such as a common cold or dust-in-eye is to blame, the umpire generally returns when the illness has passed. If the injury is more complex—a muscle sprain or tear, or the more serious head trauma behind home plate—certain protocols from the Commissioner's Office and Umpire Medical Services must be followed, including but not limited to the head injury/concussion procedure that may include a stint on the 7-day concussion list in addition to a battery of tests before the Director of Umpire Medical Services will clear the umpire for return-to-play. The injured umpire may not even leave the assigned city in which he sustained his injury until he is cleared to travel by the Commissioner's Office. 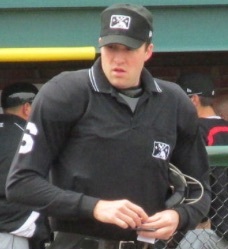 In order for an umpire to receive clearance to return to work, the umpire must be capable of working home plate, even though he will generally not work the plate on his first game back. In the event of significant injury-related time off, an umpire may first be assigned to the minor leagues for rehabilitation. Some injuries are clearly less severe. Whereas the Crew Chief specifies an umpire's position in the rotation when a new umpire joins the crew—subject to certain restrictions—the Director of Umpire Medical Services and Commissioner's Office specify where in the rotation a returning ill/injured umpire will be placed. > 6 times by the 2B Umpire (43%). > 5 times by the 1B Umpire (36%). > 3 times by the 3B Umpire (21%). The answer seems somewhat consistent with the MLBUM guideline, as second base umpires have gone behind the plate more often than any one of the other positions have, but it happened that way in less than half of the injury cases in 2016. As the U2-to-UIC guideline is subject to Crew Chief discretion, we can observe this protocol by crew. Other injuries require more extensive care. For instance, Jerry Layne's crew has suffered three game-ending plate umpire injuries this season (6/27 Layne; 8/15 Wendelstedt; 8/31 Layne), and in all three cases, the second base umpire has replaced the departing plate umpire. On the other hand, Dale Scott's crew has seen two such injuries (6/19 Scott; 7/16 Scott), resulting in the first base umpire filling in behind home plate on both occasions. Some crew chiefs may opt to maintain the integrity of the rotational order by having the 1B Umpire move to home plate if the injury occurs early in the game (e.g., 5/26 Guccione [1st inning]; 7/16 Scott [1st]; 5/23 Nelson [3rd]; 7/15 Fairchild [1st]). Similarly, some may choose to preserve the alignment if the injury occurs extraordinarily late in the game by having the 3B Umpire work home plate for the final moments (e.g., 6/23 Emmel [9th, 2 outs; the game ended on the very next pitch]). Second base is left vacant in a three-person alignment. Second base offers a few distinct advantages: Neither the first nor third base umpire has to actually change positions as a result of switching to three-person mechanics. In other words, if the first base umpire is in a rhythm calling plays at first base, he, for the most part, will continue to fulfill that role uninhibited. The second base umpire will also have a full day off between plate games, even if it is only one day: If either a first or third base umpire works the plate, that usually will be a consecutive plate day, unless the crew/that umpire has a day off immediately before or after the game. A call-up's first game will be on the bases. Another variable to keep in mind relates to MLB's vacation schedule and umpires joining a new crew. For instance, a Triple-A umpire who is called up will not be assigned to work the plate for that first game (The MLB Umpire Manual forbids it), and instead will be placed at second or third base. Similarly, a Major League umpire switching crews may (1) not have plate gear, or (2) have recently worked a plate game. If any such umpire is assigned to second base during a game in which the plate umpire becomes injured, such a second base umpire may not be equipped to move behind home plate. Finally, some base umpires—especially new-to-crew umps and during the first or last game of a series—might not even have their plate gear with them. See this article about travel delays and CB Bucknor wearing street clothes during an MLB game for more information. 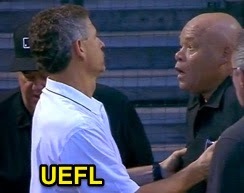 In all, there is much to consider when assigning a replacement plate umpire during a live game, and although MLBUM suggests the second base umpire, there are a handful of extenuating circumstances that can have an impact on the Crew Chief's decision.